Political commentators feared for the wellbeing of French President Emmanuel Macron in the next few days after being faced with his biggest political crisis just yet, the loss of his political ‘father’ after the relationship between the two has soured. Over in France, Interior Minister Mr Gerard Collomb's resignation is seen as a major blow to French President Emmanuel Macron. The former mayor of Lyon once described his relationship with Macron as similar to father and son and French media say that this ‘divorce’ could cost him dearly. 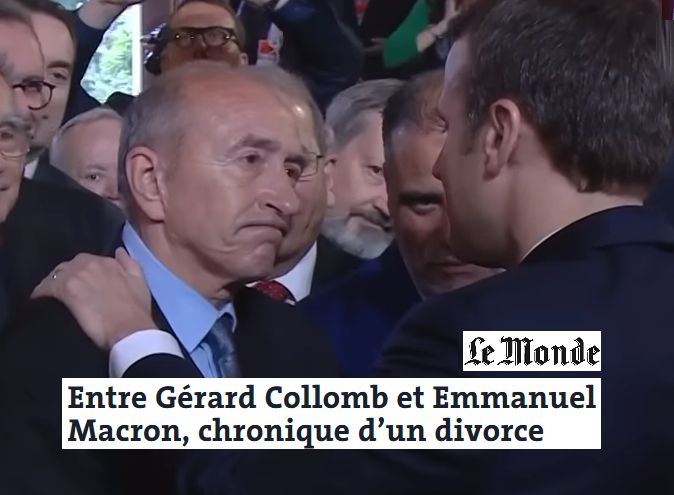 Famously, Mr Collomb cried when Mr Macron won the presidency back in 2017 (see video). Mr Collomb, who was rumored to be very unhappy with Mr Macron’s presidential style, had already told the Elysée Palace that he wanted to return to his beloved Lyon (France’s third biggest city) but his initial attempt to resign Monday was harshly denied by Macron. This Monday, amid the sadness of the country over the passing of singer Charles Aznavour, Mr Macron's office said the president had vetoed Collomb's resignation attempt because of "his confidence" in the 71-year-old. Related coverage: <a href="http://thegoldwater.com/news/38414-France-Le-Pen-Media-Slam-President-Macron-Over-Gangsta-Selfie"> France - Le Pen, Media Slam President Macron Over ‘Gangsta’-Selfie</a>. However, Mr Collomb on Tuesday said he still intended to quit and would see the President in person to offer his resignation. "The French people and the people of Lyon need clarity, so I maintain my offer to resign," Mr Collomb said. "Considering the rumours and the pressure, I don't want the fact I will be a candidate somewhere tomorrow to affect the way forward for the interior ministry." The city of Lyon, where he was mayor for 16 years will become his new political hunting ground. The French press stated that the relationship between Marcon and Collomb turned over a scandal surrounding one of Macron's former security aides, Mr Alexandre Benalla who was filmed roughing up protesters while wearing a police helmet (the scandal gained momentum over the summer after it was revealed that Mr Macron knew about it but didn’t really care). Rightwing National Rally leader Ms Marine Le Pen tweeted about the stability of Macron's government given the acceptance of Collomb's resignation: "Gerard Collomb has resigned again? How long is this sketch going to last?"